There has been a lot of “emphasis” is some circles about Posting and number crunching. POST BUY ANALYSIS is promoted as the way to evaluate a buy. But where do these numbers come from? In most cases they come from handwritten notes by viewers. In some markets viewers of certain demos are even paid to turn in their diaries and others are “volunteers”. Many diaries are tossed out due to obvious errors and incompleteness. 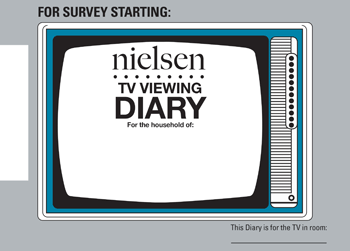 Check the Nielsen Website so that you can know how to fill out YOUR diary. It seems precarious that millions of dollars ride on handwritten forms that the selected viewer must be taught and encouraged to complete and return. Many of the major markets have meters that are located in the household and connected to the TV (STB – Set Top Boxes). These units report to the Nielsen Center the TV activity. What they do not report is if anyone is even in the room watching. Bathroom breaks or TV’s left running in an empty house are reported as viewers. In fact to quote a 2013 industry report – “Nielsen isn’t abandoning set-top-box (STB) data, but it is substantially scaling back plans to use it for local measurement.” The STB was designed to give “overnight” national results. Yet recently (Sept 2016)Nielsen announced “Nielsen is finally phasing out its antiquated paper TV diary ratings system, which it still uses to record ratings in 140 local markets. The company said today that by mid-2017, it will provide electronic measurement in its local TV ratings across all 210 of its designated market areas (DMAs). According to Steve Hasker (Nielsen Global President) "The diary tends to favor the larger media properties because respondents, when they fill out a diary, are more likely to record their significant viewing time and less likely to record their less significant viewing time," he said. "As a result, the larger networks benefit from the diaries, and that creates a resistance from those clients to move beyond the diaries." The Major networks are the primary source. Local Stations are next in line. The local ad agencies are small potatoes that pay a courtesy fee for use. If you have big ratings the system is “fair”. If you don’t? This not to say the results are manipulated for the profit of Nielsen. It does indicate that there is a momentum to avoid change. It is difficult to assess the impact of new technologies, interactive TV sets and the pervasiveness of cable when the methodology of reporting viewing retains significant input from those being measured. How many diaries, STBs or other Nielsen devices TOTAL the sample size in your market? In Los Angeles, the nation’s second largest TV Market Nielsen had only 1000 Nielsen Families in 2013. They then announced another 300 with a target total of 1300 in 2016. Imagine the amount of money nationally and locally these Nielsen Families can direct. There is also the problem of “zero”. This occurs when a time slot shows no viewers in the sample. The 200 smaller markets have 600 or less sample families. The weighting of “Nielsen Families” to account for low returns in an economic group, even when paid for the return is also a problematic factor to determine who is actually watching. After all, if you don’t turn in a usable diary, you don’t get p[aid regardless of your viewing habits. If you are only paid a dollar, why work hard to be accurate? With Diaries scheduled and ratings periods dates announced stations and Networks respond. In the February Sweeps there are “special programs” heavily promoted to bump up viewership temporarily. Stations have used bulk mailers, radio promotions, billboards to influence their ratings. Obviously the larger stations with bigger budgets can have more influence through the use of public media. Is that cheating? While extreme, it is reported that Nielsen is involved in a lawsuit in Tampa FL where a TV host allegedly contacted the Nielsen families directly. In the 1980’s there were two competing firms offering the rating services. Then, without public discussion or overview Arbitron announced that they would drop TV ratings and Nielsen announced they would drop Radio ratings. Since then there has been only token attempts to compete in this field. The competition revolved around independent “qualitative” research. Economic and lifestyle research chipped at the edges of Nielsen. In 2012, Arbitron was acquired by Nielsen. Today, Rentrack has also become an alternative to Nielsen with many affiliates throughout the country choosing to use them. Sinclair is a huge user and proponent of Rentrack. The ratings Rentrack stations get are often completely different from what Nielsen stations get so it waters down the system even more. There is no accredited global measurement of social media, You Tube, DVR or smart phone usage to view content. Nielsen has instituted a PPM program for radio, Personal Portable Media. The jury is still out on that one. Further it’s a radio only measure. There is no rating system that accounts for watching a football game on your Ipad or Hulu’ing your favorite TV series. There is indication that Visual media continues to fractionalize. NFL game day rating have fallen, some as much as 10%. The argument is that the game has changed not the overall viewership. Whatever the reason, overbuying the audience with overwhelming repetition is a bad strategy doomed to failure. Exciting and innovative content is the only strategy for future success. However that discussion is for another day. Budgets that command 15% or more of the voice in a category should Post Buy. That is not the issue. How to use the PBA is the question. Those who rely solely on the PBA as the measure of the media buyer’s value will in short order be out gunned and out maneuvered by a more skilled buyer. The CPM’s and Reach and Frequency numbers can easily be manipulated using today’s software. Change a high rated show or time slot and the efficiency skyrockets. However the audience could be 180 degrees away from desired. Further, and more insipid is the audience duplication issues. That function of reach and frequency can also be manipulated with the push of a button. Relying on a PBA for cost and value is a hollow shell. Working with LSM’s to “make budget”, and good “banter” to discover the LUR is essential. Correlating previous buys with their results is a guiding device. Predicting which new shows are underpriced is also part of the art. Its not simple math. The PBA may help keep the overall price form creeping up but it won’t give you an assured value. It will give you a disaster that you can blame on some other element. Remember the old adage – Liar, Liar, Pants on Fire. Is the PBA the most accurate method of determining value? No. Media buying done solely by the Nielsen Data is akin to giving a paint brush to a computer and demanding great art. The effective media buyer must respond to the client’s past results, trending, competitive information and client goals. The PBA cannot be relied upon as your primary decision device. It is only a small tool in a big bag. You would not give your million dollar budget to the family down the street, but that’s exactly what a PBA does. Further that family is influenced by the station’s advertising. That family does not know what new shows it will like because they haven’t been seen yet. Remember that a PBA happens AFTER you run the schedule. The measurement system is full of holes. To complicate matters even more is the Portable issue. Many “TV Households” are viewing on portable devices that are not currently measured. Add to the Nielsen emphasis on the major markets and the 170 or so “small” markets are still in the dark. Good Media buying is an art. It is a collaboration between the client, the agency and the station representative. Discounts, promotions and sponsorships intertwine without measured Nielsen Numbers. A clever buyer can numerically manipulate a schedule to make any calculation you choose. The Nielsen numbers that are used are the only digital data we have and its accuracy is barely acceptable. When you get your PBA from us, look at the only factor that really matters – the performance of the campaign.